Road tax: abolished 1937. Use car tax. No such thing as road tax! The AA, Mazda, What Car, the police, the RAC, Renault, HMRC, DirectGov and others all get it wrong when they mention the long-dead ‘road tax’. This tax hasn’t paid for roads since 1936, and even then only paid for larger roads, never local ones. Even fringe groups such as the Association of British Drivers know ‘road tax’ is, in fact, a “tax on cars”. It’s also possible for major organisations to get the name right. HM Treasury – which is the entity that sets the tax so ought to know its correct name – does not call it ‘road tax’, it’s VED every step of the way. The Post Office also gets it right. It talks about ‘car tax’, another everyday name for Vehicle Emissions Duty. ‘Car tax’ is an accurate colloquialism. ‘Road tax’ is wrong and a term dangerous to cyclists. In the 1909 ‘People’s Budget’, an entity called the Road Fund was created. Monies started to be collected by this fund in 1910. 100 years later it would be good to think that some organisations would make it a New Year’s Resolution to be accurate. 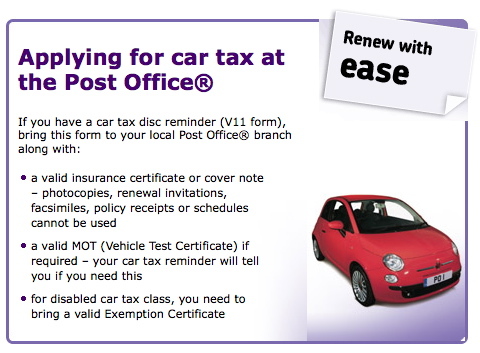 If the Post Office can get it right, so should the AA, the RAC, HMRC and all the other organisations which are living 73 years in the past. Or, come one second after midnight tonight, 74 years in the past. This entry was posted on Thursday, December 31st, 2009 at 7:29 am	and is filed under No such thing as road tax!. You can follow any responses to this entry through the RSS 2.0 feed.